Slow Cooker Chicken Tikka Masala: A warmly spiced classic Indian dish made simply in the slow cooker and lightened up with yogurt in place of heavy cream. Faithfully and strategically designed each week, my weekly menu is my sanity to organizing my weeknights. But there are some weeks when I’m terrible at sticking to my weekly menu. Needless to say, my perfectly planned menu doesn’t always work out. And sometimes I’m left with food in the freezer that either I don’t feel like using for its original intention or I’ve completely forgotten what the original intention actually was. Such was the case with the package of boneless skinless chicken thighs that I found last week. I let Google do all the hard work to find a new recipe and the one I found not only sounded amazing, but I already had all of the ingredients in the house for it: this slow cooker chicken tikka masala. Now, I’m not at all well-versed in Indian food and I can probably count on 2 fingers the number of times I’ve eaten it but I’ve been curious about the flavors and I’ve been wanting to try it at home. You know, in a controlled environment. 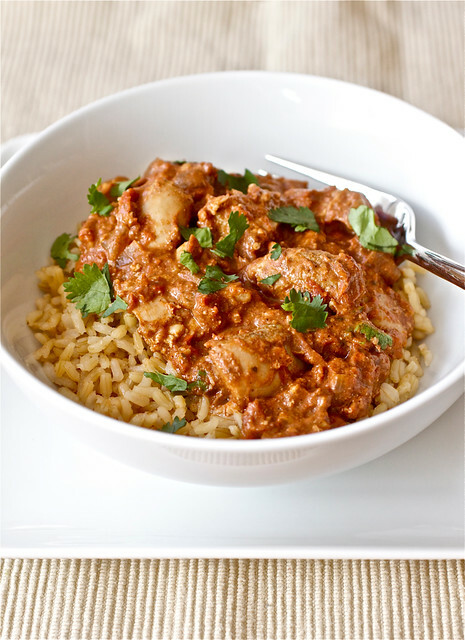 And I have to say that both Kyle and I loved this slow cooker chicken tikka masala! The yogurt, tomatoes, and all of the spices combine into a warmly spiced stew that soaks into and tenderizes the chicken and leaves you with this amazing meal for a cold night. I especially loved the minimal prep, the slow cooker method, and being able to enjoy the smell of the cooking stew all afternoon long, but I’m sure you could make the whole recipe on the stove top if you don’t have 4-5 hours to let the slow cooker do its thing. And because this is a hands-off recipe, you’ll have some time to make some easy homemade naan bread. It’s the perfect vessel to sop up all of that delicious sauce! The only change I made to the recipe, which I’ve reflected below, is that I chose not to brown the chicken before putting it in the slow cooker. I didn’t want the extra fat and calories from the butter and I wanted to let the yogurt help to thicken the stew so I could also cut back on the heavy cream in the last step. My changes worked perfectly to help lighten up the dish and I think I’ve found a new favorite for us! To prep the chicken: Cut the boneless, skinless chicken thighs into 1- to 1 ½-inch pieces. Sprinkle the coriander, cumin and salt over the chicken, then stir in the yogurt until all the pieces are evenly coated. Place the chicken in the bottom of a 6-quart slow cooker and put the jalapeno on top of the chicken. To prep the sauce: Melt butter in a medium saute pan over medium high heat. Add the onions, garlic, and salt, then stir. Cook, stirring frequently, until the onions begin to lightly brown around the edges. Stir in the garam masala and ginger and cook until fragrant (about 1 minute) before adding the crushed tomatoes and sugar. Stir well, scraping the caramelized bits from the bottom of the pan, and bring to a boil. Pour the sauce over the chicken in the slow cooker. Cover and cook on low for 4-6 hours, or until the chicken is very tender. Pour heavy cream into the slow cooker and stir gently until the color is even. Replace the lid and let cook for 10 minutes or until bubbly around the edges. Serve over hot rice topped with a generous amount of chopped cilantro. Wow, Indian food in the slow cooker – I love it! Tikka Masala is definitely my favorite Indian dish, this sounds like a great recipe for it. This looks really great! I’ve only eaten Indian food a few times, as well. I’ve always wanted to buy garam masala, but shied away from it. I’ll definitely be buying it now and trying this out! Wow, this looks amazing! I have wanted to try Indian food, but it seems so intimidating. Putting it in a crock pot makes it seem more doable. Thanks for sharing the great recipe! Indian food are one of my favourites. I’ve eaten it much more times than you have but never tried to cook one up EVER. Cheering for your bravery! This is one of my favorite Indian dishes…I will definitely try this, since I’m on a roll with the slow cooker. Beautiful color on the finished dish! My husband would eat Indian food every night if I let him, this will be the perfect thing to serve him on a busy weeknight. You are my new hero! I love the idea of cooking tikka masala in slow cooker! Recipe saved! Yum! This looks soooo good. My husband and I love Indian food. I will definitely try this next week and come back to write a review on the recipe! I would like to try this but have a few questions first. Cut the boneless, skinless chicken thighs into 1- 1 1/2 inch pieces. What is 1- 1 1/2 size? I understand 1-1/2, but not the numbers shown. Annah: The chicken should be cut into 1 to 1 1/2 (one and one half) inch pieces. Garam masala is an Indian spice mix so if you check Google for a recipe, you’ll be able to see the ingredients and you may already have them in your pantry. To me, garam masala is a warm spice mix but it’s difficult for me to tell you what it tastes like…but keep in mind that it will taste different to everyone, and especially because it is a mix, it could actually be different depending on where you eat it. Hope that helps! This looks wonderful! I am an Indian food virgin but throwing all the ingredients in a crockpot somehow seems less scary. I adore using my crockpot. How awesome is it when supper is cooked as you walk in the door?? Made it today and turned out great! Easy to make and perfect for a gloomy fall day! Loved it, thanks!! I was just wondering how many servings are in this dish (so that I can count the calories for it)? I really want to try it out since the only Indian dish I cook is Curry Chicken and I am soooo addicted to it! Meagan: The recipe serves 6. I love using my slow cooker. I am trying this recipe soon. Isn’t this recipe awesome?? I made it a few weeks ago (I also found it via Tasty Kitchen–love that site) and will blog about it at some point, heh heh. I love your picture–it’s totally making my mouth water! Just put everything in the crock pot – looking forward to eating it tonight! Just a few questions on substitutions – 1. Can I substitute chicken breast for thighs and if so, what would you recommend on cooking time? ; 2. Can I throw frozen chicken in there instead of thawed and just cook it longer? ; 3. Is it possible to sub olive oil for butter and leave out the sugar? I made this with cut up chicken breasts tonight. Delicious!! Made this today.. Absolutely delicious! Thanks for sharing! Hi. This recipe sounds wonderful, but wondering if you know the nutritional info – I’m on Weight Watchers and wondering how to figure out the points. Thanks. Nancy: I haven’t calculated the points for this recipe but if you use WW Online or the WW mobile app, you can build a recipe to figure out the points. This looks absolutely delicious, and I think it’s misleadingly easy (the ingredient list might scare folks off). Definitely needs some naan bread alongside! This one looks like a keeper! I can’t guarantee that this recipe will work on high because I haven’t tried it but try it for 2 hours. Just make sure the chicken is cooked through – it should be 165 degrees F.
Love this – thanks! Will definitely brown the meat in a bit of healthy oil – there’s no substitute for the layer of flavor browning produces! I like trying new things, & I randomly found thi recipe. Didny even now what garam masala was until I smelled it & thought uh oh, husband isn’t going to like something this crazy (he’s a meat & potatoes guy). Turned out, he loved it & asks for me to make it frequently! Kyle (my husband) had the same reaction after I had the same reservations about whether the would like it. It’s such a winner! Yes, take the jalapeno out and discard it. Delicious and wonderful looking very nice and yummy..